What makes a bicycle frame good? What makes it great? As the heart of any bicycle build, the frame carries the identity of the bicycle as much to observers as it does to the rider. The geometry, the rigidity and other characteristics of the materials, the build quality and even the appearance all come together to give the personality - the soul of the bicycle. A tiny change in any of these key aspects can make a tremendous difference to the relationship that the rider has with the bicycle. It is obvious when looking at a frame that it's a much simpler object than a wheel. Yet anyone who has ridden many bikes will tell you that two bikes that look "pretty much the same" can be different in a way that makes one a cherished and faithful partner, where the other could just be the "weak link in the chain" that gets banished to the garage on training days and cursed on race day. So what makes this difference? Truthfully, it can be said that for some people, it is just a matter of personal preference or taste. However, in most cases, if you have consulted with experienced bike sizing experts and you know your style as well as intended type of riding, you can eliminate much of that indecision. There is no substitute for a properly fitted bike! It might even be said that barring blatant manufacturing flaws, the biggest factor that makes people label a bike as "no good" may be poor fit. After all, so many professional riders seem to be able to put in incredible race times regardless of whether they are riding this brand or that brand. What are the Keys to a great bike? But once the fit is locked down, what can take a bike from good to great? We believe that the first key is suitable Geometry. The next key is Power Transfer and the final key is reliable Strength. 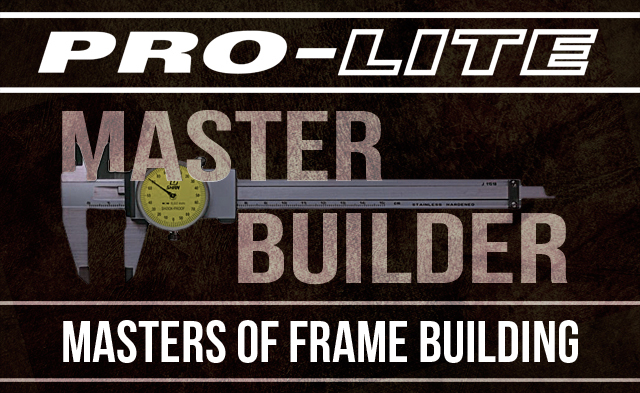 What makes Pro-Lite Frames so special? In preparing this article, this question was posed to the very people running the show. Staff Profile: Who is he? The first stop was the General Manager, the guy who takes care of everything from sourcing raw materials, to resolving manufacturing issues at the factory, to working with prototypes to find the issues before they come up. His first response was about the tubing we use. It's natural for him to think of this because he was the guy that originally found the source of the unique 7046 alloy that Pro-Lite uses to make light, strong and amazingly affordable frames that rival Scandium. It is his years of experience that has helped as he has worked closely with our factories and welding staff to understand the unique needs of each type of bicycle at the most fundamental levels, resulting in our frames being built as all frames should - Perfectly! Having said that, his suggestion was to take a closer look at the geometry. Experience: 34 years building frames, Pro Racer since age 22.
could think of right through to 1991. Since it really is a rarity that bicycle manufacturing decisions are made by people with actual racing experience, it is no small advantage to have someone at the helm who can see not only "both sides of the issue", but is actually familiar with the many differences in each type of racing and how they are served by specific aspects of the bicycle and its geometry. Starting as part of his engineering apprenticeship training at Fairey Engineering at the age of 16, he had the freedom to experiment with many variations in design as his racing plans called for them. In spite of being told that "alloy could never be used for a bicycle", he chose to focus on building alloy frames. Now, working with Jasper and Pro-Lite's skilled staff, they are able to lock down frame designs that target each facet of cycling, not by following the way everyone else does it, but designing with geometry learned from experience - the best way that works! It is also on the experience of Steve that Pro-Lite places such a high importance on Strength and Power Transfer. With literally hundreds of races under his belt, he knows exactly what it feels like to experience a breakage of every part of a bicycle - and most bones in the human body. He also understands that even if you don't end up on a stretcher, you can't win a race if your bike is in pieces. Likewise, if your bike is flexing around like a strand of well-cooked spaghetti, you might as well be pushing your competitors ahead of yourself. Energy wasted is energy lost. When seconds count, the last thing you want is to be pushing down on the pedal and putting that energy into your bike's flex to be soaked up like a sponge before the next pedal stroke. It's no coincidence then that many people who ride Pro-Lite immediately notice the snappy responsiveness of wheels and frames designed to Transfer your Power into Speed. Our QC Director pointed out that frames can be made by anyone with a welder. Indeed, anyone with a little experience can build a jig and make a frame. From his point of view, the most important thing to watch is preparation. A little known fact about welding is that it can easily take as much as 10 times more time to set up and check that everything is correct than it does to complete the welding. With the tubing prepared for welding by computer controlled CNC machines, it's not difficult to put a headtube on straight. The real focus for the QC department is the alignment of the whole frame - from the head tube to the rear dropouts. Drilled into the welders and QC staff alike is the critical need for perfect alignment. This is vital for control in any high speed environment. The input from these key individuals has what impact on our production then? Quality assured by using computer directed cuts with all tubes CNC cut in preparation for welding. Strong frames, made with quality tubing drawn to application-appropriate thicknesses and shapes. Every frame that comes out of our factory is ready to race - ready to win - right out of the box.